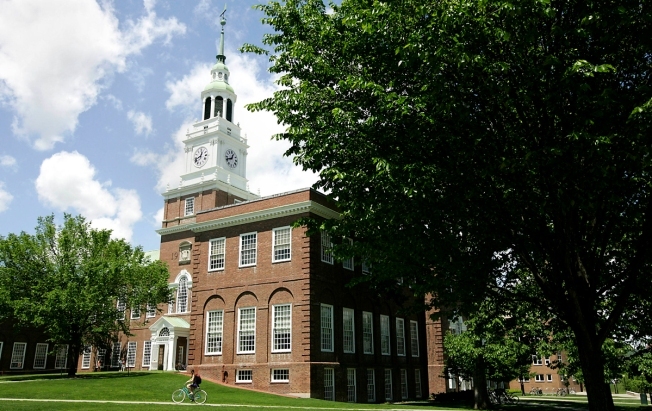 Last year, 15 students wrote to the school newspaper, The Dartmouth, alleging the three created an environment in which "sexual harassment is normalized"
Baker Hall stands on the campus of Dartmouth College, the smallest school in the Ivy League, in Hanover, New Hampshire, on Tuesday, June 2, 2009. A third Dartmouth College psychology professor facing sexual misconduct allegations has left the school following an internal investigation and recommendation that the school fire him. Professor William Kelley resigned Tuesday, according to Dartmouth College President Phil Hanlon. Another professor, Paul Whalen, resigned under similar circumstances last month, and a third, Todd Heatherton, chose to retire. The professors were accused last year of creating a "hostile academic environment" marked by excessive drinking, favoritism and, at times, inappropriate behavior. In a letter to the Dartmouth community, Hanlon repeated that sexual misconduct and harassment have no place at the Ivy League school. "The past several months have been challenging for Dartmouth. We will now focus our attention on the work ahead to make this the best community it can be," he wrote. "I am encouraged by the progress we have made so far and know that together we can achieve this goal." Last year, 15 undergraduate, graduate and postdoctoral students wrote to the school newspaper, The Dartmouth, alleging the three created an environment in which "sexual harassment is normalized" and violated at least one campus policy related to sexual misconduct, sexual harassment or consensual relationships between students and faculty. In interviews with the newspaper, several students described an uncomfortable workplace culture that blurred the line between professional and personal relationships and said they often felt pressured to drink at social events. One woman said she felt like she was being tested at one event when a professor put his arm around her and slid it down her body. A lawyer believed to have represented Kelley declined to comment Tuesday. In June, Heatherton issued an apology and acknowledged acting "unprofessionally in public at conferences while intoxicated." The attorney general's office also is investigating.